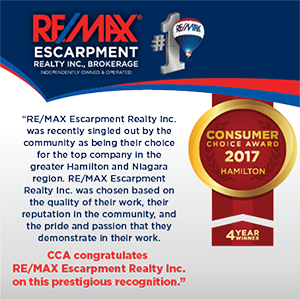 About RE/MAX Escarpment Realty Inc. | DiMascio Group Real Estate | RE/MAX Escarpment Realty Inc.
We are proud to announce that RE/MAX Escarpment has been awarded the Consumer Choice Award for 2017 - for the 4th year in a row! At RE/MAX Escarpment, we are proud of the confidence that our clients place in our agents, making us the most successful real estate brokerage in the Hamilton-Burlington region. We have been #1 in the REALTOR ® Association of Hamilton-Burlington every year since 1994.
estate industry throughout Hamilton-Burlington. Since opening our doors in 1980, our focus has alwyas been providing innovative technology and unparalleled customer service in order to create a totally remarkable real estate experience. In 2011, we merged with RE/MAX Del Mar Realty Inc. to create a local powerhouse brokerage with over 425 REALTORS® and 7 convenient office locations in upper and lower Stoney Creek, Ancaster, West Hamilton, Hamilton Mountain and 2 offices in Burlington. In doing so, we have gained premier market share in our trading area, and we have maintained the #1 position within our local Real Estate Association every year since 1994. Servicing Ontario's famous 'Golden Horseshoe', our region stretches north to Flamborough and south to Lake Erie, East to Burlington and West to Haldimand and Brant Counties. Hamilton is less than an hour drive to both Niagara Falls/Buffalo USA and downtown Toronto. At RE/MAX Escarpment, our motto is "A Knowledgable Consumer is Our Best Customer" and with that in mind, we have developed a Client Experience Center called "InTheSquare". Here you will find RBC Mortgage Specialists, Mortgage Brokers, Insurance Brokers and Lawyers all in one hip space ready to answer all of your questions and service the remaining steps in the buying or selling process. We have also developed various comprehensive websites to maximize exposure for our listings and customize the search process for our buyers. With buyers moving to the area from all over the globe, we are equipped to communicate in various languages to help our clients feel more at home while working with us. REMAX Escarpment.com can be translated into any language with the click of a button or you can speak directly to any one of our bilingual or multilingual agents. Founded and still operating today as a family business, RE/MAX Escarpment prides itself on building strong relationships with its REALTORS®, consumers and its community. Whether it is supporting a local business, donating time and money to charity or just having coffee with a satisfied customer, our company values each and every person it has the pleasure of working with... just as if they were part of the family. With 15 Life Time Achievement, 63 Hall of Fame, 2 Circle of Legends, 2 Diamond Club, 4 Chairman’s Club, 17 Platinum and 68 100% Award Winners, it is easy to understand why our sales people achieved some impressive statistics for 2009. Amongst 2,767 members in the Hamilton Board, RE/MAX Escarpment Realty Inc., Brokerage has 4 of the Top 10, 15 of the Top 100 Sales Representatives in the Board.